The secret of these little ravioli-like parcels is the back-and-forth between the creamy ricotta cheese and the sharp Parmigiano in the filling. 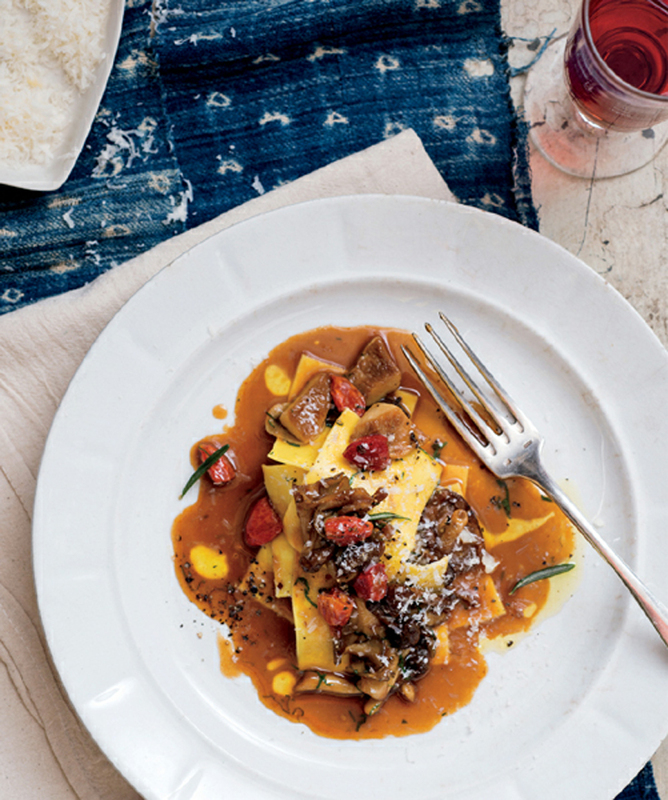 Browned butter and sage is the most ubiquitous finishing sauce for pasta in Northern Italy, and deservedly so, because it’s so good; it shows up on everything from these tortelli to ricotta ravioli to gnocchi and gnudi. Note that the filling must be refrigerated for at least 1 hour. Put the ricotta, eggs, Parmigiano, and nutmeg in a medium bowl, season with salt and pepper, and fold together with a rubber spatula until just incorporated. Spoon the ricotta mixture into a piping bag fitted with a number 7 (⅜-inch) plain tip and refrigerate for at least 1 hour, but no more than 8 hours. Line a baking sheet with parchment paper and lightly dust it with rice flour. When ready to cook the tortelli, fill a large pot about two-thirds full with water, salt it liberally, and bring to a boil over high heat. Meanwhile, melt the butter in a medium wide sauté pan over medium-high heat. Add the sage leaves and cook, stirring with a wooden spoon, until the butter is browned and fragrant, about 2 minutes. Remove from the heat and cover to keep warm. When the water has come to a boil, lower the heat slightly so the water is at a gentle boil and gingerly add the tortelli a few at a time. Stir carefully once to keep them from sticking together, then cook until the tortelli float to the surface, 2 to 3 minutes for fresh, or 4 to 5 minutes for frozen. Remove with a slotted spoon, letting the excess water run off, and transfer to a bowl, or very gently drain in a colander. Add the tortelli to the sage butter and toss briefly to coat. Divide among individual plates, sprinkle each serving with Parmigiano, and serve immediately.